WAIST HIGH: Paul Weller Named 'Godlike Genius' At NME Awards. Paul Weller Named 'Godlike Genius' At NME Awards. 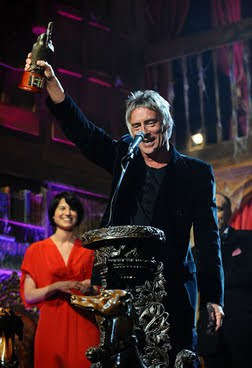 From NME: Paul Weller has collected the final award of the night at the Shockwaves NME Awards (last night), picking up the Godlike Genius gong at the O2 Academy Brixton in London. Primal Scream's Bobby Gillespie and former Clash guitarist Mick Jones, whose bands have both claimed the prize before, presented Weller with the honour, with the Modfather giving a short speech to the crowd. Weller then performed a six-song set with his solo band that spanned his career and brought the Shockwaves NME Awards to a close. The star was joined by ex-Oasis guitarist Gem Archer and My Bloody Valentine's Kevin Shields for the set, which saw him play songs from across his career, including recent single "7+3 Is The Striker's Name." The supergroup also ran through tracks including The Jam's "Eton Rifles" and UK chart-toppers "Start!" and "Town Called Malice." NME editor Krissi Murison introduced Weller onstage first, alongside The Clash's Mick Jones and Primal Scream's Bobby Gillespie. "We couldn't quite believe he hadn't been given it before," Murison said, before Jones and Gillespie took to the mic. "He wrote some of the most beautiful, poetic songs," Gillespie said, before listing a number of Weller's most-revered tracks. He added: "I could go on all night 'cause he's written so many classics." Gillespie then called Weller "the real deal," before letting Jones speak. "It's our great pleasure to present this award to this incredible man, and to this man who we love," Jones exclaimed, after which a video montage of stars including Noel Gallagher, Carl Barat and Sir Peter Blake praising Weller played on the big screens. Weller then took to the stage himself. "What could I say, it's taken them 30 years," he said first, before adding: "I'm embarrassed because people said so many nice things about me...but they're all true! God bless you, have a good night!"